What's an event with a great, big sign? Between 10 am and 1, attendees checked in, loitered around and ate a big brunch in the lobby of the Dairy Center (about a block from our office.) 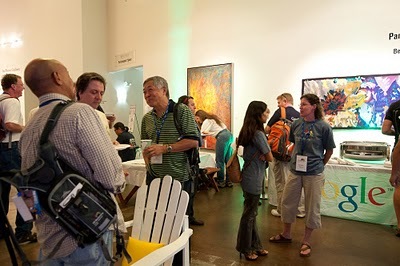 The energy was palpable. 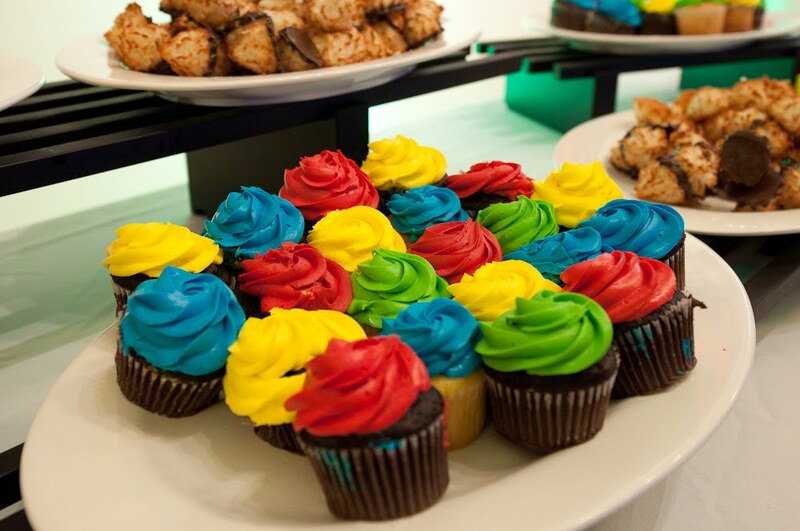 People chatted and ate brunch before things kicked off. At 1, we herded everyone into the Rocky Mountain Room for the Basecamp kickoff and keynote presentation. After a few announcements about logistics (drink lots of water to stave off altitude sickness, etc) John got up and welcomed everyone to Boulder. John (our Product Manager) announces the release of SketchUp 8. Launching in the keynote, John talked a little bit about SketchUp’s history and where we are now: Over one million unique people use every week. 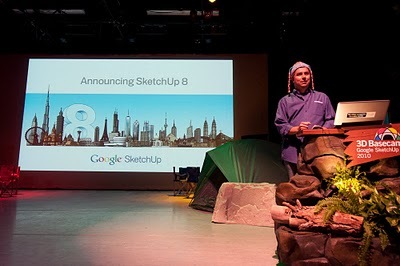 He announced SketchUp 8, running through some slides to go over what’s in the new release. Bryce gets ready to talk about the Solid Tools. Scott just finished showing Image Igloo. 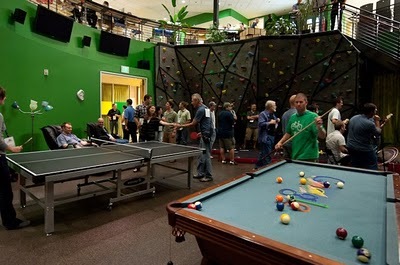 Google staff wore wool caps so attendees would recognize us. 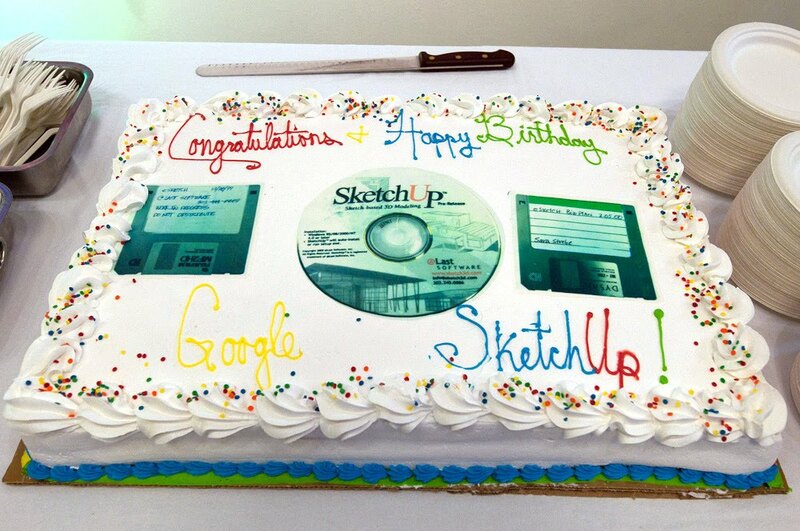 Afterwards, we retired to the lobby for champagne and birthday cake – SketchUp is 10 year old, after all. 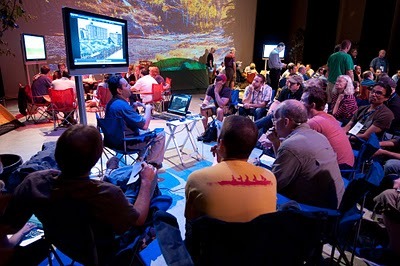 Basecampers were on their own for dinner, but “birds-of-a-feather” groups of like-minded attendees hit the town together. Much beer was drunk. At the end of Day 1, we celebrated SketchUp's 10th birthday with cake and champagne. 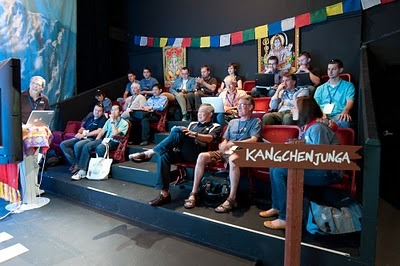 Thursday morning, everyone gathered again in the Rocky Mountain Room for the beginning of the Unconference. I explained how unconferences work (participants set the agenda) and folks started pitching their ideas: One by one, attendees took the mic and told everyone what they’d like to present, learn about or just discuss. After speaking, they handed a sticky note with the idea to one of us, and we put it on the Big Board. 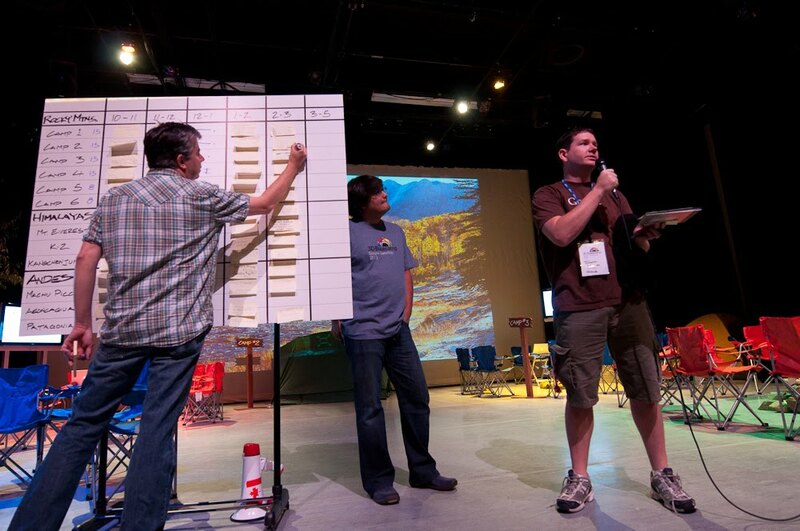 As people proposed sessions, we put them up on the Big Board. After some frenzied shuffling and re-arranging, everyone headed off to 12 different spaces for the first session. 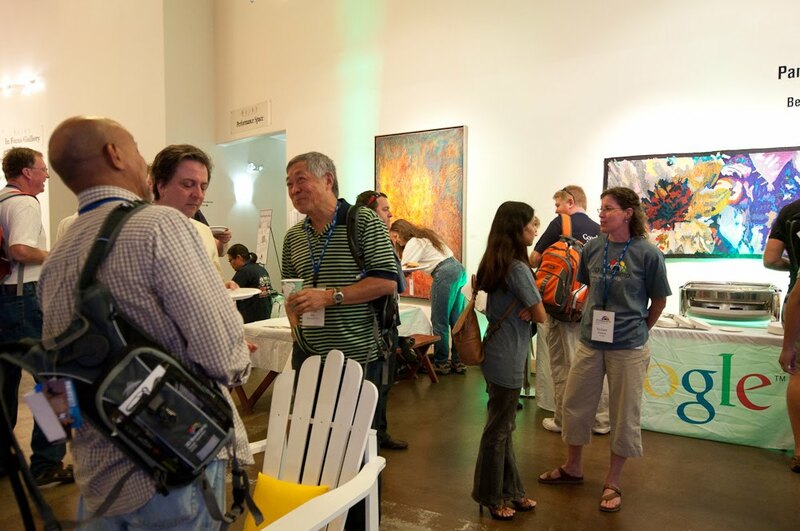 Unconferences are always a little nuts at the beginning; this one was no exception. The rest of the day was spent in three more sessions. 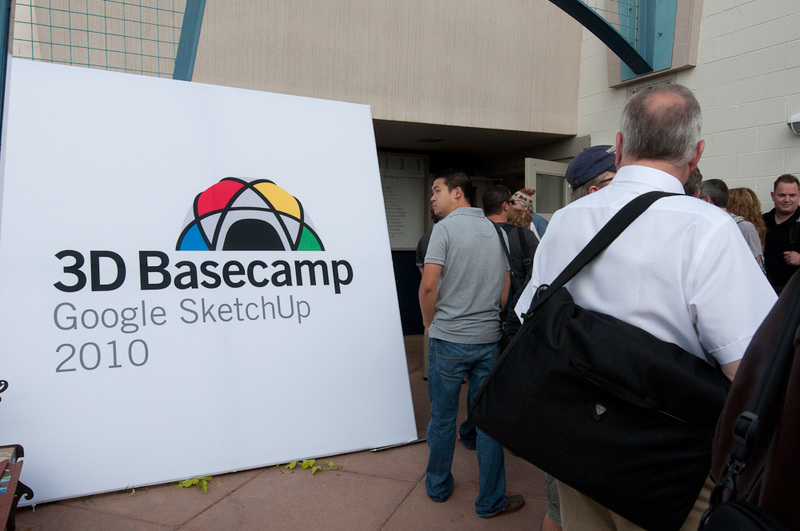 You can see the list of all 41 sessions (and read notes taken in all of them) by visiting the 3D Basecamp website. Unconference sessions took place all over the Dairy Center. 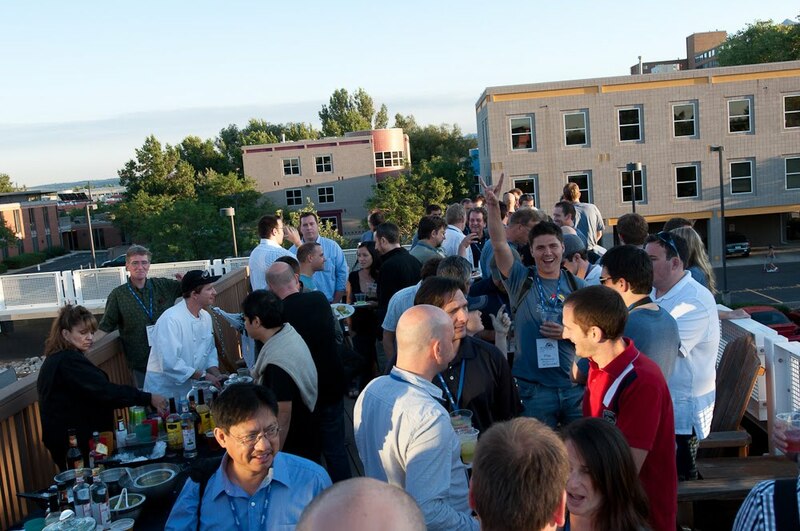 Thursday evening, all of us trooped over to the Google Boulder office for a party on the deck. We ate, we drank, we listened to music, we talked about highly esoteric (some might say geeky) aspects of SketchUp’s development. About five hours after it started, we escorted the last revelers out of the building and locked up for the night. 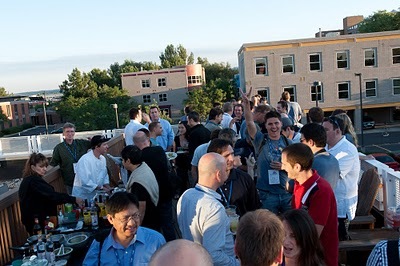 Attendees gathered on the deck Thursday evening. The weather was perfect. Some folks hung out in the rotunda. Bright and early Friday, we regrouped at the Dairy Center for the start of Day 3. Developers of plugins and other tools – our Friends of SketchUp – presented their amazing wares all morning. Around noon, everyone dispersed to take naps and make their way home. 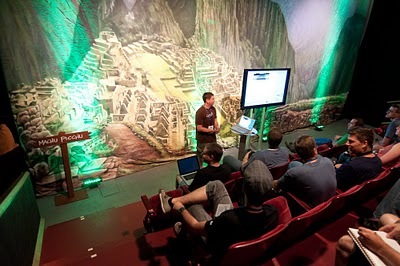 Check out the complete 3D Basecamp 2010 photo album and download anything you like. Thank you to everyone who helped us make this this best 3D Basecamp yet. We can’t wait to see you all again soon. Looks like a great event. Sure hope to make it next year! Zurich in March was fun, but this looks nice as well! 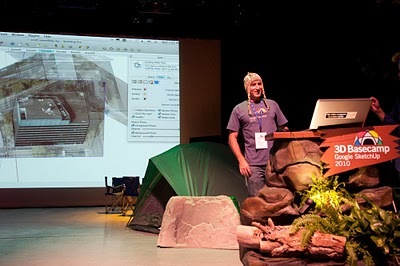 What I would have given (if I had anything to give) to have been at 3D BaseCamp 2010. 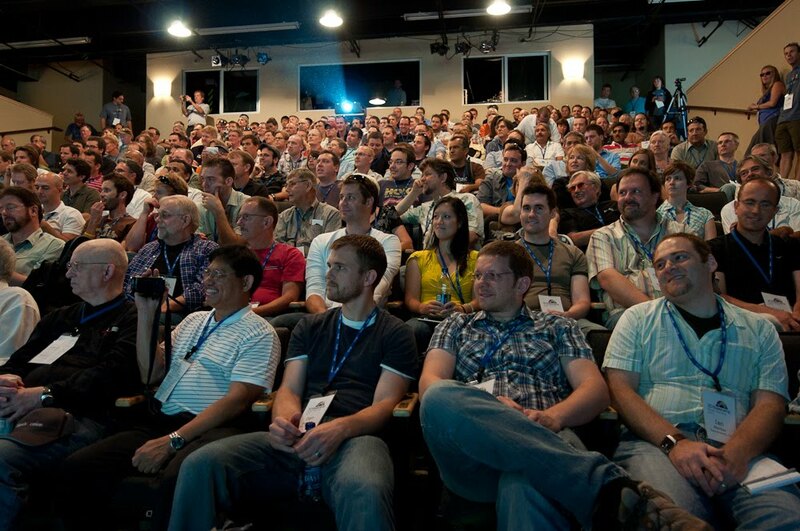 Or even the, invitation only mappers/modelers conference in Europe. God hate being poor. Keep up the great work Google. I LOVE SketchUp and Google Earth. I was wondering if there were videos made of each session and if these would ever be made available to the public?